The historic border town of Berwick-upon-Tweed is split into three Council Divisions by Northumberland County Council. Berwick is a town facing unique challenges arising from its singular history. It has picturesque town walls, a thriving cultural life that includes the annual Riding of the Bounds, the Civic Society and Maltings theatre, and successful local businesses such as Allan Brothers and Simpsons Malt. Yet, in common with much of North Northumberland, it also faces problems of social deprivation and a lack of affordable housing. Anne-Marie is confident that Berwick would make an incredible success of the economic boost provided by a dualled A1. She has built a strong coalition in the town around her campaign to drive this project forward. 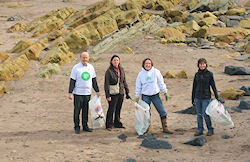 In both 2007 and 2009, Anne-Marie's Green Action Team cleaned up Spittal beach, taking away more than twenty bags of rubbish and a six foot tall tyre! 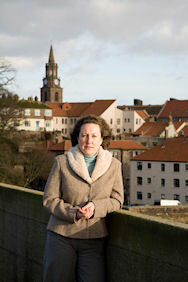 Anne-Marie is also a Governor of Berwick High School and a member of the Berwick Civic Society.